The fewer than 10 per cent that were at the hands of the military and police were not crimes. 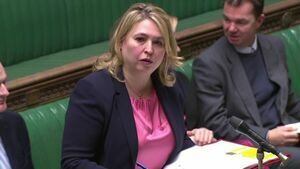 UK Northern Ireland Secretary Karen Bradley. Posted in Misc and tagged Karen Bradley, Northern Ireland, The Troubles at 3:15 pm on March 6, 2019 by Bodger. In her defence, she has no fupping clue what she is talking about. The same could be said about the entire british government, may, johnson, gove, reesmooooog and the rest of this clueless mob are extraordinarily incompetent…it almost boggles the mind. Is this the same person who said she did not understand why Nationalists would not vote for Unionists? She’s a tory. They’re oblivious to reality because of years of inbred privilege. Following this utterly disgraceful logic – those that gave the orders were committing the crimes. Didn’t work at Nuremberg and doesn’t work for Bloody Sunday. I’d say those that were killed would be delighted to know they were killed in a dignified and appropriate way. On their tombstone, I’d imagine. It’s at times like this I put aside common sense and have a good old belly laugh at the absolute state of the UK under the tories. Then I grow back up and remember we are talking about real human lives and it kind of sobers me up. Aye. I have been thinking about this a bit. I used to buy into their arrogance and believe that they were actually good at what they did, even if I didn’t approve of their politics. Now I see that not only are they reprehensible people, they’re also useless. Yes. I’ll agree with that and buy a t-shirt if you have one. While they shouldn’t have been executed, they weren’t innocent bystanders – the three of them had a hire-car with 84 kg of Semtex explosive inside. The car they’d parked was the one to be pulled out to allow the bomb car found later in Spain to be parked. Not familiar with car bomb tactics, are you ? Links to sources on the Wiki page. You mean members of the IRA involved in an armed struggle? Save your RIP’s for those that deserve it. Yeah much better to be a self loathing west Brit shrill,that a proud Irish republican…. Mariead,Sean and Dan were murdered on this day. Have some self respect,get off your knees pal,which part of being Irish are you struggling with ? Aren’t dead martyrs better for the cause than live criminals? Anyone here go through labour handcuffed to a trolly? Anyone know if they found her guilty ov’ an’ting btw? Splutter. As if there weren’t enough abrasive comments, this idiot of an MP comes out with this? There are victims involved here. There is still a peace process, a very fragile one at that. Seriously, we will one day look back at those warming relations between Ireland and the UK from the 2011 visit by QE2 and the subsequent Ceiliúradh / State visit in London in 2014 – it was all oul guff really between two ineffective heads of state clinking glasses. Our divisions run too close to the bone, too many lives lost and hatred and retaliation still in the air. One of the only pluses of Brexit, I think, is the introduction of the bile that is the DUP to Great Britain. HA! Now YOU have to deal with them. Enjoy! Ha ha! You hit the nail on the head there. 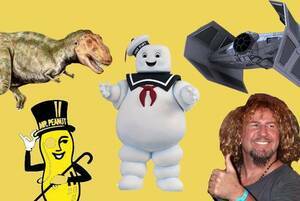 Dear Britain, here are your Religious Flintstones back. This is the woman who didn’t realise that Catholics in NI don’t vote for unionist parties and Protestants don’t vote for SF. Well, after the short detente, at least we know what we’re dealing with going forward..
this wan is just stirring the poop. she’s not THAT stupid. We need this woman on the next Dancing With The Stars. This woman is a prime demonstration of just how much NI means to the powers that be in Westminster. Killing innocent people is and was a crime. It was then and it is now. Killing IRA men and women wasn’t a crime. After all Gerry and the rest of them never tire of telling us ‘the struggle’ was a ‘war’. This does not take away from the fact that Karen Bradley is out of her depth and clueless. The victims of Bloody Sunday were not members of the IRA. The Bloody Sunday enquiry is the context in which this comment was made. A good example of the British security forces murderous incompetence is the botched killing of young Lurgan man, Michael Tighe, 17 years old, in 1990. His murder in a joint RUC/MI5 operation was taped, but the evidence was destroyed. He had no PIRA or Republican association whatsoever. The idea that his killers should not face justice is an affront to democracy. As I’ve said before British politics is a cess pit. Bradley is an offensively stupid illustration of what passes for ministerial office. It’s no coincidence that the country is currently set on a path of self destruction. That’ll make the Catholics vote for Unionist parties. The brits have been butchering peasants all over the world for hundreds of years, so she merely reflects the thoughts of the brit ruling classes, It still goes on.